Chinese Premier Wen Jiabao's visits to India and Pakistan from Dec. 15 to Dec. 19 are fruitful and successful with rich achievements, Chinese Foreign Minister Yang Jiechi said on Sunday. "To cement and advance the all-weather strategic partnership of cooperation between China and Pakistan is our common strategic choice," said Chinese Premier Wen Jiabao. 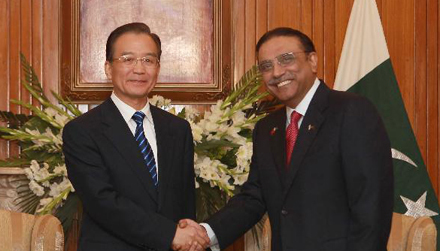 Visiting Chinese Premier Wen Jiabao told Pakistani lawmakers on Sunday that the two sides should further enhance their strategic cooperative partnership. China and Pakistan signed a number of trade deals worth about 10 billion U.S. dollars, visiting Chinese Premier Wen Jiabao said Saturday. Calling culture the spirit of a nation and driving force for national development, Premier Wen said cultural exchanges serve as bridges for communications among different peoples. During a meeting with BJP leader Sushma Swaraj, Chinese Premier Wen Jiabao said China-India relations have kept good momentum, thanks to joint efforts made by the governments and civil societies of both countries.